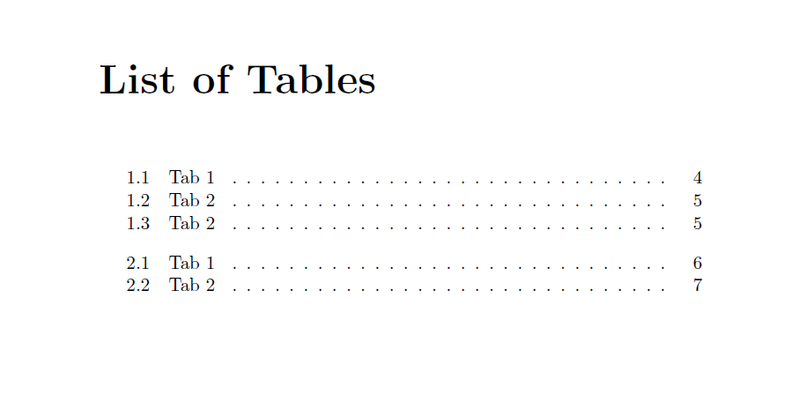 In this code, the list of tables for the first three are 1.1, 2, 3 and for the second set they are 2.1, 2. I would like to add the prefix "1." to the appendix table listing for the first three and "2." to the second such that the string is 1.1, 1.2, 1.3, 2.1, 2.2. Any ideas on how to do this? Not the answer you're looking for? Browse other questions tagged tables table-of-contents numbering or ask your own question.